New Holland says its Rustler 850 62-hp unit is the ideal, all-purpose utility vehicle no matter whether it’s used for hauling heavy loads or going on a recreational adventure. The original Rustler was launched in 2009, and new models were launched in 2016 with production starting in early 2017. Since then, the product line has been expanded to include a four-passenger model as well as a camo version. 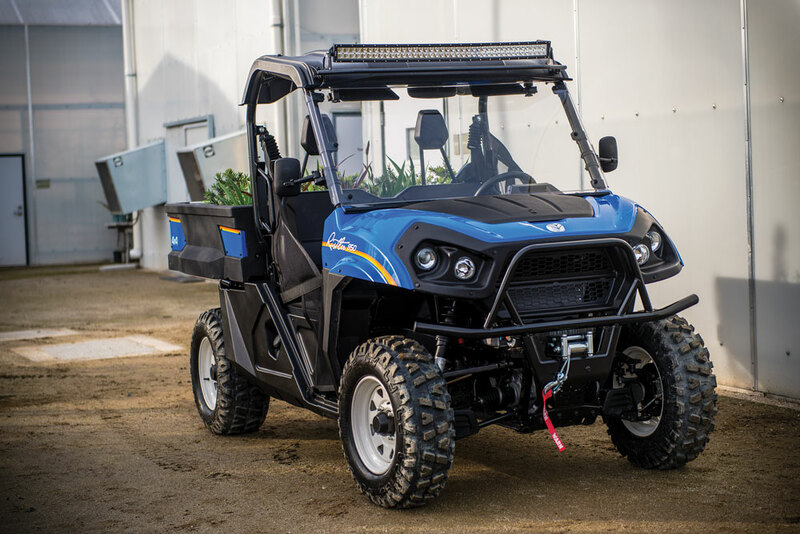 Being an agricultural company, New Holland set out to provide a UTV solution that was really designed for farmers and ranchers, who, like professional contractors, depend on their UTV for their work and livelihood. The company created the Rustler to be reliable and rugged enough to handle day-to-day work requirements, while providing the capabilities for off-road adventures when the work is done. More specifically, the Rustler’s four-wheel, progressive rate suspension provides a superior ride, New Holland says, whether the bed is empty or fully loaded, and the bed itself has outstanding capacity. You can haul a full pallet with confidence knowing that you have the power under the hood to get you from point A to point B and anywhere in between. Plus, the bed won’t rust, crack or make any rattling noises while in motion, which is certainly a plus for anyone taking their Rustler out on hunting trips. Another great feature is the Rustler’s push-button four-wheel drive and differential lock. The four-wheel drive can be activated on the go to help get through rough or slippery conditions and on to your next task. Electronic power steering (EPS), four-wheel double A-Arm suspension and front and rear sway bars increase traction, improve handling and ensure sustainable comfort, especially on off-road terrain. When it’s time to do heavy-duty hauling, an oversized, rust-free load bed, which offers a 1,500-lb total load capacity, is easily customizable to accommodate any need. And, even when maxing out capacity, ride quality is never compromised because the Rustler is equipped with dual rate springs which consistently help it to deliver one of the smoothest rides in its class, New Holland says. These Rustlers can also be outfitted your way. Buyers can select from a variety of accessories from enclosed cab systems and windshields to winches and lights. For safety, New Holland includes four-wheel disc brakes for reliable stopping whether the bed is empty or under a full load. The Rustler also comes standard with a three-point harness and ROPS structure to protect the operator. The Rustler 850’s 62-hp EFI engine is precision-tuned to maximize power and performance, while its four-wheel double A-arm suspension ensures a comfortable ride. Standard front and rear sway bars promote superior agility and handling on off-road terrain. The vehicle’s cowl takes styling cues from current New Holland products and its finish will promote New Holland’s signature blue color. In the compact equipment realm, New Holland also makes skid steers, track loaders, compact excavators, compact tractors and even small wheel loaders. Learn more about New Holland here.